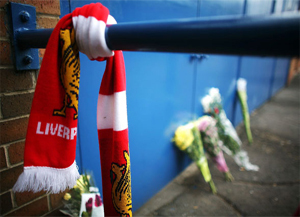 When Sir John Madejski, ex-chairman of Reading and prominent Conservative Party donor, called for a minute’s silence at their game against Liverpool last weekend to mark the death of Margaret Thatcher, it was met with predictable and justifiable derision. For Liverpool supporters and residents, Thatcher’s premiership was one marked by deindustrialisation and urban unrest, and culminated in the tragedy of the Hillsborough disaster in 1989. Reading confirmed the only minute’s silence planned would be for the 24th anniversary of that tragedy, when 96 fans went to a football game and didn’t come home. Frankly I think it’s rather cheap that they decided not to show any sort of respect for her, because, to be honest, she did really deliver what football is today, particularly with the Taylor report, and the all-seater stadia. How unfortunate that it was the death of 96 more football fans, crushed to death in a stand unfit for human beings, that led to such recommendations finally being implemented. The warning sirens had been aired almost 20 years earlier when fire took 66 lives at Ibrox in 1971. The Safety of Sports Grounds Acts 1975 introduced regulations which required the need for safety checks at top level grounds, but it was slowed at lower level clubs, as political interest waned. In May 1985, the main stand at Valley Parade, home of Bradford City, caught fire and burnt down, likely caused when a discarded match was dropped onto a pile of uncleared litter which lay below the seats. Four minutes later, fire had engulfed the stand, a timber structure with a wooden roof. Fans piled onto the pitch, thankfully due to the lack of perimeter fencing so common at other grounds, but 56 people couldn’t escape the flames. If the regulations followed in the 1975 Act had been followed, it shouldn’t have happened. The subsequent Popplewell Inquiry into the events elaborated on this negligence, and made some further key recommendations; for grounds to require safety certificates, to ensure fences met certain safety requirements. Home Secretary Leon Brittan told Parliament following the Bradford fire that there would now be “no question of putting up a fence to create a trap”. But the immediate concern for the Thatcher government following 1985 was how to combat hooliganism, following the Heysel tragedy. David Evans, chairman at Luton Town, who was also a Conservative MP, spearheaded the campaign for a national membership scheme for football supporters, and the Football Spectators Act 1989 sought to introduce an ID card for any supporter wishing to travel to away games. Football supporters were stigmatised, public safety became secondary to public order. Such draconian measures were wiped away after following the Taylor report into the Hillsborough disaster. The causes of the Hillsborough disaster and cover-up are now well known. Warnings about the ground’s dilapidated condition were ignored, the local authority negligent in assessing its safety, the police grossly negligent in stemming the flow through the turnstiles. Fences were constructed, gates locked and fans piled on top of each other to slowly suffocate to death. In its immediate aftermath, the authorities closed ranks and squared the blame squarely on Liverpool supporters. Only last year, 23 years on, has the truth finally been acknowledged. Even following the publication of the Taylor report, Margaret Thatcher was wary of its conclusions. She rightly saw it was a “devastating criticism” of the police, but wished only to acknowledge its “thoroughness and recommendations”, rather than its “broad thrust”. So, whilst all-seater stadia were introduced immediately, the police’s negligence went unchallenged. The warning signs were there for the Thatcher government, as were the legislation and inquiry recommendations to bring football’s facilities up to a decent standard. Instead, fans themselves became the target. Why did it have to take another 96 to die at Hillsborough before the lessons of Bradford were heeded? It is a national scandal and a national tragedy. Rather than crass or disrespectful, it was right that the only silence last weekend in football grounds was for those who needlessly died within them so many years ago. Pingback: Thatcher’s legacy: 96 is greater than one | HIYA. I'm Dom Smith and this is my blog.